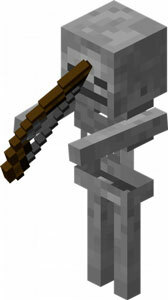 Skeleton are hostil habitatns which found in the Overworld of Minecraft. Its skeleton body is build from different rectangular forms in grey color which try to simulate the bones of an skeleton. They are archers so you will alwyas see them with a bow on their hands. Skeletons can be quite skilled, since they can raffle obstacles and climb ladders when they are persecuted by a player. They are easily to detect thanks to its characteristic sound of the bones when walking. This creature will appear in dark places, and it will burn under the sun light. Skeletons don’t get along with wolfs, so when a Skelenton sees a wolf will try to scape or will attack. The same will occur with an Iron Golem. They have quite precision when shooting the bow and they are quite fast, so they may make difficult to move on thanks to its constant attacks. These beings will only appear in the Overworld of Minecraft, but you alsow ill find randombly in the creature generator in the dungeons. For Skeleton generation it has to be a light level lower or equal than 7.